Internal medicine veterinarians are specialists that are qualified to perform advanced diagnostic services and create treatment plans for illnesses related to internal body systems. Internal medicine veterinarians are specialists with advanced training on the function, diagnosis, pathology, and treatment of internal body systems. Areas of training for internal medicine vets can include many fields of study including oncology, endocrinology, hematology, infectious diseases, cardiology, gastroenterology, immunology, neurology, nephrology, and respiratory disease management. Routine duties for an internal medicine specialist in private practice include performing diagnostic tests and exams, evaluating scans, utilizing a variety of specialized medical equipment, performing surgical procedures, updating patient files, and supervising internal medicine vet techs or surgical vet techs. They may also provide professional consultations at the request of a general veterinary practitioner. Internal medicine specialists in private practice may work at small animal veterinary clinics, large animal veterinary clinics, or emergency clinics. Specialists in internal medicine may also find employment with other organizations such as veterinary colleges, research labs, and commercial pharmaceutical companies. Those working for veterinary colleges may have additional duties such as giving lectures, supervising lab work, advising students, and overseeing research projects. Those working in corporate environments tend to focus on creating diagnostic testing and treatment options. Veterinary internal medicine is one of the many specialties in which veterinarians can achieve board certification. Internal medicine specialists may focus on a particular subspecialty such as oncology, cardiology, or neurology. They may also specialize by working with one particular species or in a category such as small animal, large animal, equine, or exotics. An American Veterinary Medical Association (AVMA) survey conducted in December of 2014 found that there were 2,611 diplomats in the specialty of veterinary internal medicine. There were 1,269 specialists focused on small animal internal medicine, 539 specialists focused on large animal internal medicine, 355 specialists in oncology, 269 specialists in neurology, and 248 specialists in cardiology. All veterinarians must begin their careers by gaining admission to a veterinary school and successfully completing their Doctor of Veterinary Medicine degree. Once they achieve the basic veterinary degree and license, a candidate interested in pursuing the internal medicine specialty must make a serious educational commitment. First, they must complete a one-year rotating internship in medicine and surgery (or demonstrate equivalent clinical experience). They must then complete an additional three to five-year residency in internal medicine (with the exact length depending on their area of focus and the requirements of their individual program). Options for residency include subspecialties such as cardiology, large animal internal medicine, small animal internal medicine, neurology, and oncology. At the conclusion of the residency, a candidate must pass the general board certification exam, demonstrate that they have the appropriate credentials, and complete a specialty exam. After passing the exams the candidate is granted diplomate status in the veterinary specialty of internal medicine. The Bureau of Labor Statistics (BLS) reported a median annual wage of $87,590 for all veterinarians in the most recent veterinary salary survey conducted in May 2014. The lowest paid ten percent of all veterinarians earned less than $52,530 per year, while the highest ten percent of all veterinarians earned more than $157,390 per year. 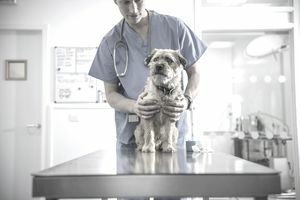 Board certified specialists tend to earn salaries even higher than the top end of this compensation scale, but unfortunately, the BLS does not offer salary data for each of the veterinary specialties. The 2011 AVMA Report on Veterinary Compensation found that the median salary for internal medicine veterinarians was $127,000 per year, while the mean salary was $144,488 per year. The survey also showed that internal medicine vet specialists in the 25th percentile of earnings brought in $103,000 per year, while those in the 90th percentile earned more than $220,000 per year. The Bureau of Labor Statistics (BLS) survey indicates that the veterinary profession will show solid growth from 2014 to 2024. The field is expected to expand at about 9 percent, which is a rate faster than the average for all professions surveyed. The lengthy and rigorous nature of specialty training programs and the challenging nature of board certification exams ensure that only a limited number of professionals are able to attain certification each year. Those who are able to achieve board certification in internal medicine are therefore in high demand and should have many quality options for employment.